Counting scale balance KERN CXB 3K0.2 with several options to facilitate the weighing of material and counting up 30,000 pieces. Stainless steel weighing plate 300 x 225 mm. With battery: approx. 200 hours (Charging time 8 h) Minimum Weight per piece 0.1 g, Max. 3 kg; Readability: 0.2 g; Reproducibility: 0.2 g; Linearity: ± 0.4 g; weighing stabilization time: 2 sec; Time heating (temperature): 30 min, allowed ambient conditions -10 ° C to 40 ° C. air humidity tolerated 15% - 85% (non-condensing). 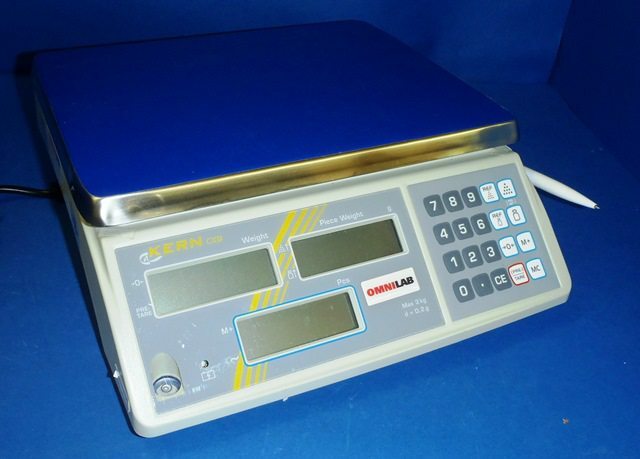 Data interface: RS 232C Dimensions: 400 x 300 x 100 mm (platform) Weight: 4 kg. Power supply: 230 V, 50/60 Hz, balance 9 V DC, 800 mA.